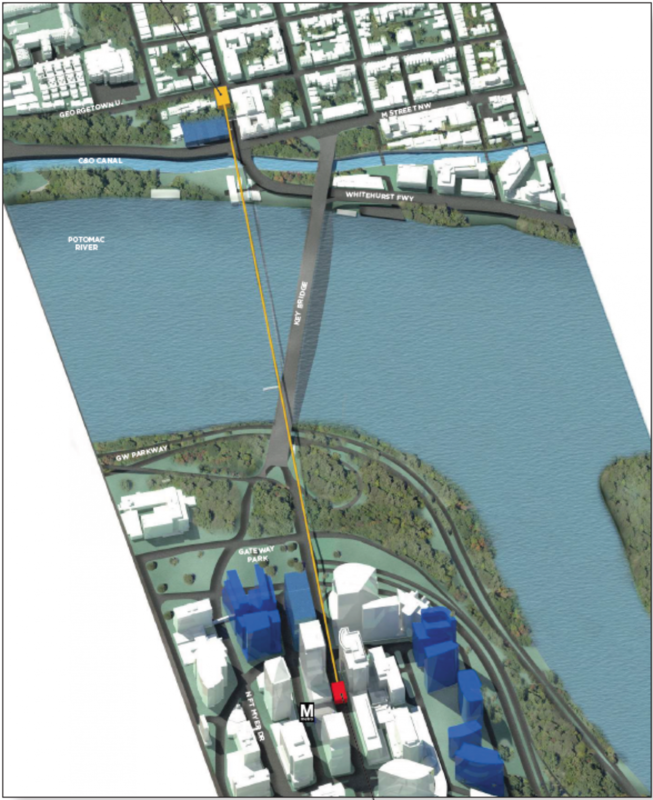 Image from the Georgetown-Rosslyn gondola feasibility study. David Alpert’s recent post on the Georgetown – Rosslyn Gondola stoked some excellent conversation in the comments, and also revealed some common misperceptions about gondola technology and the area where it could go. I was the project manager for the gondola feasibility study, and have been involved in the project since 2013 when I started as the Georgetown BID's transportation director. In the interest of clearing things up — and in generating interest in the system — here are some responses as best we can detail. Ankara Gondola Station #2. Image by Steven Dale used with permission. 1. Comment: Adding a dedicated bike/ped path on Key Bridge or building a new bike/ped bridge across the Potomac would be just as effective, and much lower cost. One thing I learned during my involvement in this project is that the current side paths on Key Bridge are themselves 1980s additions to the original 1927 structure. While I don’t have a price tag for that work, their presence precludes a cheap or convenient way to add more width, convert them to vehicle lanes, or make other structural changes to the existing bridge. As part of the Georgetown 2028 planning process, we explored a new bike/ped bridge from Waterfront Park to Roosevelt Island. Based on span, height, and clearance, the forecast was $30-40 million in cost. Linking M Street to Rosslyn would balloon the same type of bike/ped connection to triple or more of that cost due to height and span increases. The needed civil infrastructure for a fixed span greatly exceeds what is necessary for a gondola or other ropeway due to their weight and counterbalance systems located at the stations. A multi-use trail bridge would need numerous support points in the river and on land, the gondola needs only three. So the cost and land impact would be, in my estimation, greater than the gondola, and I am not confident that this imaginary asset would achieve 6,500 trips per day — a conservative estimate of gondola trips. Peace Bridge by Santiago Calatrava in Calgary cost $24.6 Million in 2012, and spans 428 feet. Image by Ryan Quan licensed under Creative Commons. Several comments honed in on the idea that this project wouldn’t be necessary if instead there were bus lanes on Key Bridge. While many backers of this project are also supporters of bus lanes, there are significant complications to this idea. Bus lanes would need to extend much further than just the bridge span to be effective, probably at least to the Rosslyn Metro on both Moore and Lynn Streets to the south, and along M Street to Pennsylvania Ave and up Canal Road to at least the Georgetown University entrance in order to accommodate the main bus services present: GUTS, Ross/DuPont Circulator, Metro 38B. 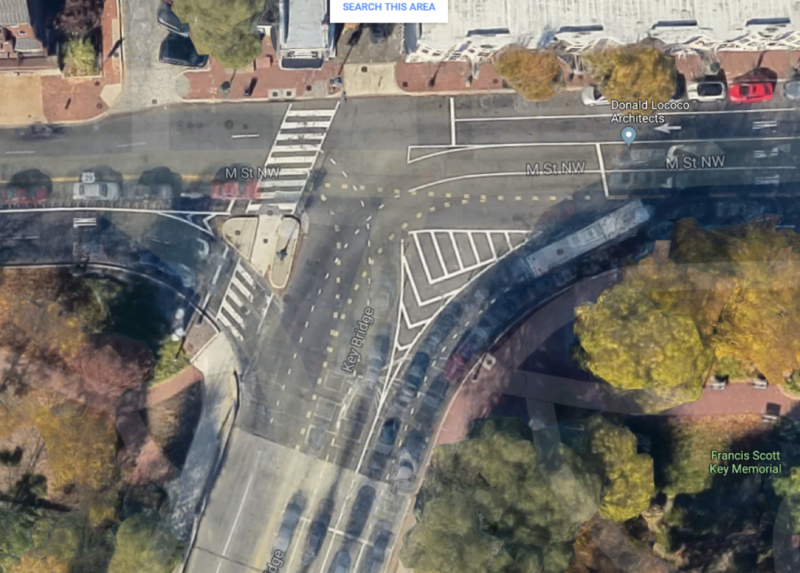 When you look at just the Georgetown side of the bridge, you start to see how hard it would be to reorganize all the traffic movements to provide dedicated bus lanes for both inbound and outbound. Remember, there are 50,000 vehicles per day that cross the bridge. Image created with Google Maps. 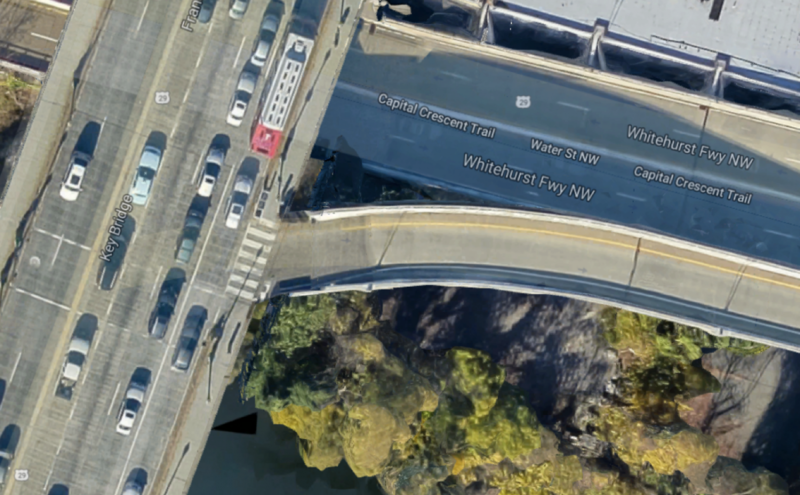 There are also connections (like the Whitehurst onramp) that would cross a bus lane, with several thousand vehicles per day using that entrance – meaning the bus lane would inevitably share the lane with others. There is a pretty significant grade change of around 60 feet between M Street and Prospect street (that’s why the Exorcist Stairs are so impressive). The gondola would resolve this with vertical circulation (escalators and elevators) at the 36th and M Street station, which would get passengers to both Prospect and M Street. One feature of using the Exxon site as a public transit location is that the footprint is large enough to host a turnaround for articulated buses. Though not yet considered by the agencies involved, we imagine a future where something like a Super X line going all the way across DC could turn around here. Passengers headed to Rosslyn Metro use the gondola for a quicker trip over the last mile — four minutes versus the 12-22 minutes it takes today. 3. Comment: Has alternative X (streetcar, light rail, BRT, J-pods) ​​​​​been studied? The feasibility study specifically looked at the question “can a gondola go here?” and answered “YES” to that question with regard to permitting, constructability, operability, utility, and estimated costs. The project did not go through an alternatives analysis (AA), which is a structured way of considering the costs/benefits of other transportation tools to achieve the same goals. In the next phase of study, environmental review, the project is required to do an AA in order to be eligible for federal funding. Nevertheless, the project backers are some of the most experienced transit thinkers around, including a former DDOT director, mayoral chief of staff, and people behind the launch of Circulator, bikeshare, and other municipal projects. We have all considered how else you might solve the problem of access to Georgetown, and besides the hugely expensive Metro tunnel (which we still support, but can’t imagine for 20+ years), nothing else works nearly as well or beats gondola on budget, permit, trade-offs, or usefulness. Medellin MetroCable Station. Image by Darren used with permission. It will be a good exercise to go through the AA and share it with the public, but we don’t expect a different type of transit technology to beat gondola for this particular cross-river connection. 4. Comment: We should put all available funding towards separated Blue Line, not spend it on a gondola that won’t be useful once Metro has tunnels. Timing is an important part of the response to this comment. With a funding commitment of $100 million, within three to four years the gondola could be studied, entitled, and built. For comparison, the seven-station, 3.2-mile gondola line in Mexico City was built in 18 months, opening in 2016.The Metro tunnels and stations require seven years of construction (this is a 2014 WMATA estimate), and the Rosslyn, Georgetown 1, and Georgetown 2 stations and tunnels alone require $2.5 billion in capital. Mexico City Mexicable Station. Image by dmom32 used with permission. The difference is we could conceivably raise the $100 million for a gondola with a mix of local funds, federal funds, and private funds (a typical public/private partnership split three ways). For comparison, my children’s school renovation has a $33 million budget in one fiscal year, and the city is currently taking on nearly 20 similar renovations simultaneously. In the transit world, the DC streetcar had a capital cost of $240 million in local funds, and is a success with around 2,800 daily riders and major economic development along the corridor. The Potomac Yards Metro infill station is now budgeted at $320 million, with ridership projections similar to our gondola ridership projections. Distilling all these costs and timing questions, we think the case is clear that the gondola has strong potential to deliver major benefits at a modest cost, and without a long project delivery horizon. Another prescient example comes from New York’s Roosevelt Island Tram, which was built in the 1970s prior to the F train serving the island. Once the F train station opened, residents petitioned to keep the tram, and it still is a useful system for the island since many inbound rush hour trains are bursting full of outer-borough commuters by the time it reaches that stop, the Tram can get you into Manhattan and onto a bus or a subway transfer stop. Roosevelt Island Tram & the Queensboro Bridge, NYC. Image by Leitner Poma used with permission. 5. Comment: The Medellin system has multiple stops. How do they do it, and could that work here? Modern gondola systems rely on a detachable grip to essentially unclip the cabins from the cable, which is moving at a constant speed. The job of a station is to decelerate that cabin, open the doors for people to board, close them again, and accelerate the cabin back up to the line speed before clipping onto the cable. Turn stations simply take the same cabin and clip it onto a different cable headed in another direction. In Georgetown, a clear path from the Georgetown landing site could be along 36th, M, or Prospect Streets. This project isn’t studying further connections, and at first blush, continuation of the alignment on any of those corridors seems unlikely for a long list of reasons. Turn Station in Medellin. Note the two different cables on the bull wheel, cabins are switched between cables at this point Image by Stephen Dale used with permission. On the Rosslyn side, you could take it from the terminal we are talking about at 18th and Lynn Street, and there is an open corridor directly to the south that opens up to Arlington Cemetery. I can’t imagine a scenario that has a gondola crossing the cemetery, but at the perimeter it could get within a short distance of the Iwo Jima memorial (a popular site for tourist visits), and from around that point, you could continue west roughly along Arlington Boulevard. This is all just what is technically possible with this technology, and no one has proposed or studied any of this, but in our imaginary “gondolas everywhere” scenario, yes, it would be possible to go to a variety of locations in Arlington with interconnections from the original Georgetown-Rosslyn Gondola. Gondola alignment (yellow/red) and future buildings (blue) shown. Image by ZGF. 6. Why are they called “gondolas,” which is a word I’m familiar with from the Venetian boats? “Gondola” is a case of linguistic evolution. First it described a small, open-top flat-bottom boat, then, when the new tech of railroads came around, they used the same word to describe an open top flat bottom railcar. Then it’s used for the open top flat bottom passenger cabin on a hot air balloon, then the same for a blimp or dirigible. The gondolas you may be most familiar with. Image by Saffron Blaze licensed under Creative Commons. At some point for both balloons and blimps, they enclose the things, but use the same word. In the 1950s the ski industry starts using the enclosed cabin as the next step after chair lifts — sure enough, it looks a lot like the enclosed flat-bottom cabin of a balloon or blimp, and they use the same word, gondola. Since most people are not familiar with hot air balloon/blimp terminology, which is where the open-topped usage evolved into a closed-cabin later adopted by the ski industry. It is an accident of history and tourism that the other gondola most people know about is the Venetian boat, the most ancient usage of the term. 1540s, “long, narrow flat-bottomed boat used in Venice,” from Italian (Venetian) gondola, earlier in English as goundel, from Old Italian gondula, of unknown origin; according to Barnhart, perhaps a diminutive of gonda, a name of a kind of boat. Used of flat, open railway cars by 1871. Meaning “cabin of an airship” is from 1896, though it was used hypothetically in 1881 in a futurism piece titled “300 Years Hence.” Of ski-lifts from 1957. Are there any other questions that you would like answered? If you are at the Court House Metrorail station and head inbound on the Orange or Silver Line, what is the next station you will reach? Feel free to ignore station subtitles.